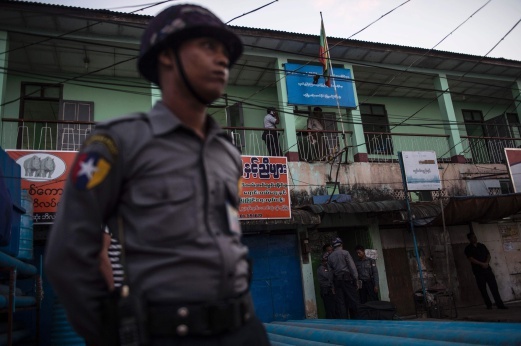 YANGON: Myanmar police said Saturday they had arrested three Muslims for planting home-made bombs around Yangon and were investigating their links to “terrorists” in Rakhine state, where the army is cracking down on the Muslim Rohingya minority. Two crude explosive devices went off inside the regional government office compound on Friday night, the third such small-scale attack to hit Myanmar’s normally peaceful commercial hub in just over a week. None resulted in any casualties but spread unease in the country’s largest city, which is not frequently targeted by attacks despite Myanmar being home to several insurgencies. They come at a time of heightened tension after weeks of deadly violence in western Rakhine and clashes between the army and insurgents in northern Shan state. Police arrested the men on Friday in Yangon’s central Thingyangyun township after questioning a woman who had been at the site of other explosions. She was not taken into custody. “Police are still investigating whether they have links with terrorists in Rakhine,” he added, speaking on condition of anonymity. Dozens of people have died in northern Rakhine after attacks on police border posts last months sparked a military crackdown. The government has blamed the raids on Islamist militants with a Pakistani Taliban-trained leader. Privately, diplomats have questioned this claim. Several videos of young men armed with knives and guns, purporting to be Rohingya freedom fighters, have appeared online. Denied citizenship the Rohingya are considered among the most persecuted people in the world. Presidential spokesman Zaw Htay posted images of a homemade bomb-making kit that he said one of the suspects had thrown away in the compound of a mosque close to where they were arrested.